1. Disconnect the 7P connector from the passenger's air mix control motor. Incorrectly applying power and ground to the passenger's air mix control motor will damage it. 2. Connect battery power to terminal No. 1 of the passenger's air mix control motor, and ground terminal No. 2; the passenger's air mix control motor should run, and stop at Max Cool. If it doesn't, reverse the connections; the passenger's air mix control motor should run, and stop at Max Hot. When the passenger's air mix control motor stops running, disconnect battery power immediately. 3. If the passenger's air mix control motor did not run in step 2, remove it, then check the passenger's air mix control linkage and door for smooth movement. вЂў If the linkage and door move smoothly, replace the passenger's air mix control motor (see page 21-188). вЂў If the passenger's air mix control motor runs smoothly, go to step 4. 4. 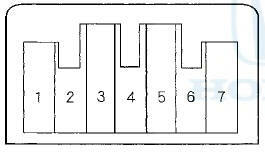 Measure the resistance between terminals No. 5 and No. 7. It should be between 4.2 to 7.8 kQ. 5. Reconnect the passenger's air mix control motor 7P connector, then turn the ignition switch to ON (II). 6. Using the backprobe set, measure the voltage between terminals No. 3 and No. 5 of the 7P connector. 7. If either the resistance or the voltage readings are not as specified, replace the passenger's air mix control motor (see page 21 -188).